FILE - In this Aug. 20, 2015, file photo, Washington Redskins offensive tackle Brandon Scherff (75) watches the team warm up before an NFL preseason football game against the Detroit Lions in Landover, Md. They had been introduced one by one, positionally, then alphabetically, until the public address announcer asked Brandon Scherff to make his way onto the floor of the banquet hall. 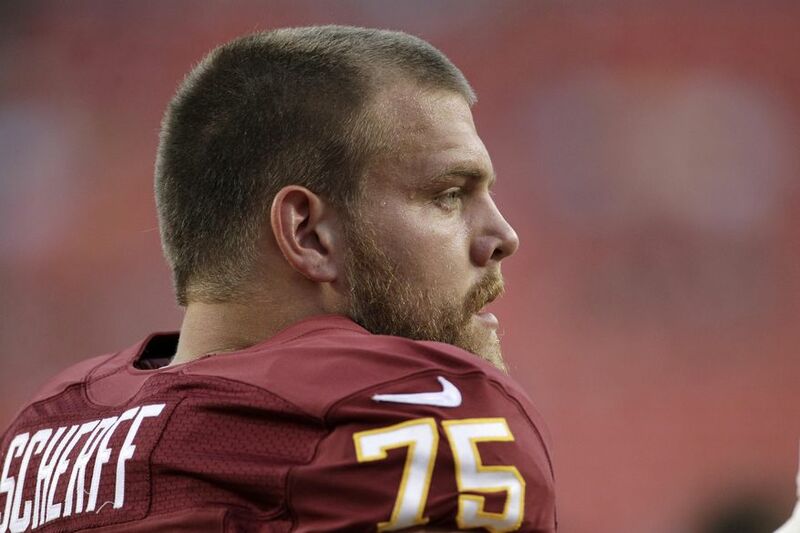 Scherff, the Washington Redskins‘ rookie right guard, deferred. He stepped out of the entryway to make room for three-time Pro Bowl left tackle Trent Williams, who received his own introduction moments later. Scherff respectfully followed, taking his seat at the annual awards luncheon at the Ronald Reagan Building and International Trade Center only after Williams had done so. Of all the traits that led the Redskins to select Scherff with the No. 5 overall pick in the NFL draft in April — strength, athleticism, toughness — there may be no better characteristic that has defined his foray into the professional ranks than his humility. Asked frequently to describe how he’s developed through the offseason, Scherff is quick to reply that he’s improved everything. Questioned about a change from right tackle to right guard after only a week of training camp, Scherff merely acknowledges that he was told to prepare to play both spots. And, when recalling the moments that followed the announcement that he had been drafted, Scherff expressed no particular delight. To him, it was merely the acknowledgement that it was time to go to work. Gripping the lectern under the bright lights of a makeshift press conference at the NFL combine in February, Scherff was presented with the idea that life, as he knew it, was about to change. The five-sport athlete who had grown up in rural, small-town Denison, Iowa and had become a star at the state’s flagship public university would, almost certainly, have to leave the Midwest if he were to play professional football. With a twinkle in his eye and a crooked smile, he chuckled. For Scherff, whose idea of happiness is sitting alongside a small farm pond with a rod in his hand and a lure in the water, there may be fewer cities that provide a bigger departure from his norm than Washington. Scrutiny can be intense, which is almost certainly why Scherff tries to keep a low profile. Aside from meeting with representatives from the Redskins during that week in Indianapolis, contact between the two parties was limited. Perhaps it was an attempt by general manager Scot McCloughan to throw off other teams; reportedly, the Redskins had only two players ranked higher on their draft board than Scherff — outside linebacker Dante Fowler Jr. and wide receiver Amari Cooper, each of whom were off the board by the time the Redskins were on the clock. The 6-foot-5, 319-pound Scherff was, still, a fitting selection. McCloughan, entering his first draft with the Redskins, subscribes to the belief that a team is built from the football out. His preference for strong, tough-nosed offensive linemen is well known; Scherff can hang-clean 480 pounds, and last season, after sustaining a right knee injury in Iowa’s season opener, he underwent arthroscopic surgery, practiced the next two days and didn’t miss a game. Redskins coach Jay Gruden had wanted to overhaul the offensive line since he arrived prior to the 2014 season, and he did so by releasing center Will Montgomery, moving left guard Kory Lichtensteiger inside and signing Shawn Lauvao to fill his void. McCloughan took that a step further this offseason, drafting Scherff and cutting right guard Chris Chester, a four-year starter, as well as hiring longtime offensive line coach Bill Callahan to join the staff. Scherff was viewed by analysts as a player who could play well on the outside, but who would likely excel as a guard, given his abilities as a blocker when teams ran the football. McCloughan addressed the team’s plans for Scherff shortly after he was drafted, saying he would be a right tackle, but when practice began on Aug. 5, not even a full week into training camp, he worked at right guard. “It’s [about] getting the best five on the field,” McCloughan said. “It doesn’t matter to me [where Scherff plays]. He could play center. He’s one of the five. We want the best five out there. The third of four children, Scherff grew up playing several sports, but his love was always football. During the spring of his freshman season of high school, in addition to playing baseball, Scherff played tennis alongside his older brother, Justin — “I tried to spin in,” he said of his serve, because opponents “never expected it” — and also competed in track and field, throwing the shot put and the discus. It was during his sophomore year, when Scherff won the Class 3A title in shot put, that Iowa’s coaches actually began to take a look at him. Defensive line coach Reese Morgan was stunned by the way Scherff, with poor form, was able to muscle a throw 59 feet, 5 1/2 inches. Scherff won the Outland Trophy as the top interior lineman last season, when he earned all-America and all-Big Ten honors. Former teammates have praised his work ethic; Carl Davis, a defensive end who was drafted in the third round by the Baltimore Ravens, said that may be Scherff’s greatest attribute. Those long days have, in one regard, inhibited one of Scherff’s favorite pastimes. While in college, Scherff would go fishing up to four days a week, spending plenty of time at a fishing hole on land owned by the family of Austin Blythe, Iowa’s center. Last year, at another pond, Scherff and a friend reeled in a 45-pound catfish, which they cleaned, grilled and ate. Such excursions allow Scherff to clear his mind, but as he found at Iowa, they can also draw him closer with his teammates. He has already found a few small holes near Redskins Park, and he said quarterback Colt McCoy has expressed an interest in joining him. So, too, has Lichtensteiger, who joked that he’s sure an invitation is coming. Scherff feels fortunate to be able to pursue doing the things he enjoys, including making a living playing football. That, in a way, could be why he’s unwilling to upset the establishment, remaining humble and deferring to the advice, and wishes, of his teammates.